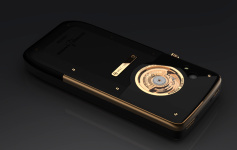 It seems that last year's hybrid Chairman phone is now out of stock and its Swiss maker Ulysse Nardin is preparing the successor. The new Chairman has a touchscreen, 8MP camera and some good 32GB worth of storage. 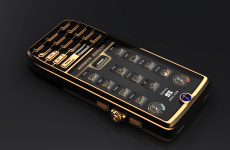 The Chairman is not the usual luxury phone you are used to see. Beneath the shiny armor lies Android-driven smartphone with all the high-end features you might expect. Besides the phone part, the Chairman has one really interesting innovation - the watch-like kinetic rotor system for passive recharging of the battery. The new Chairman extends the specs sheet with bigger 3.2-inch capacitive touchscreen (with multi-touch support) and a Freescale i.MX processor (i.MX is an entire processor family, so nothing specific here). And did we mention it runs Android? Anyway, the rest of the specs sheet includes a juicy 8 megapixel camera, a fingerprint reader for locking the thing, 32GB internal memory and HD video playback. The connectivity is also duly covered with 3G with HSPA, Wi-Fi, Bluetooth and USB. As an alternative power source you can use the built-in kinetic rotor or the crown winding mechanism - both borrowed directly from wrist watches. The new Chairman comes with Bluetooth stereo speakers and a fancy wood dock - you can put your phone there for recharging and it will also back-up all of your data on the supplied external USB drive. Ulysse Nardin will manufacture the new Chairman in several color variations based either on stainless steel or pink gold. Each of those will be made in a limited series of only 1846 units (the year Ulysse Nardin was founded). The new Chairman will ship within a month. Its price will vary from $12 800 to $49 500 in the US and may be different in other countries. From what I read it runs on Android 2.1 isn't that like 2010ish? Does anyone know what software version of android its even running?